We recently had occasion to rework a circuit board (translation – we made a mistake in the original layout). There was a copper trace that connected two pins that should not have been connected. Repair was a simple matter of cutting the trace, but we wanted to be sure that we had done the job properly. The magnification from our in-house stereo microscope made the job easier, but adding fluorescence by using the NIGHTSEA Stereo Microscope Fluorescence Adapter made it even easier still. The pictures below show a portion of the board in white light and fluorescence. The trace that needed to be cut is the horizontal line in the upper half. The photo on the left was made using conventional white light, and the one on the right shows fluorescence stimulated by blue light and viewed through the yellow barrier filter. 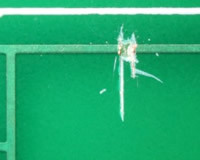 The fiberglass board material fluoresces green but the copper is entirely non-fluorescent so it appears black. The fluorescence provides much more contrast than white light, making it easier to see what you are doing. Section of printed circuit board, white light. Section of printed circuit board, fluorescence. 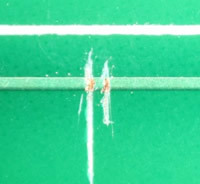 We used a razor knife to make two parallel cuts across the copper trace as shown in the photo pair below. In the white-light image it is hard to see exactly how deep the cut is. In the fluorescence image it is obvious that the cut on the left is all the way through the copper because we can easily see the fluorescence coming from the board material below the copper. The cut on the right has penetrated the solder mask layer but has not gone all the way through the copper. Parallel cuts across the copper trace, white light. 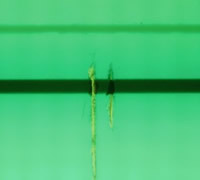 Parallel cuts across the copper trace, fluorescence. To complete the job the copper trace between the cuts was removed. 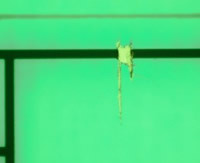 The gap is a lot easier to see in fluorescence because of the contrast between the black (non-fluorescent) copper and the green-fluorescing board. Using fluorescence helped us to do the job faster and with more confidence. White light photograph of the completed board modification. Fluorescence photograph of the completed board modification.